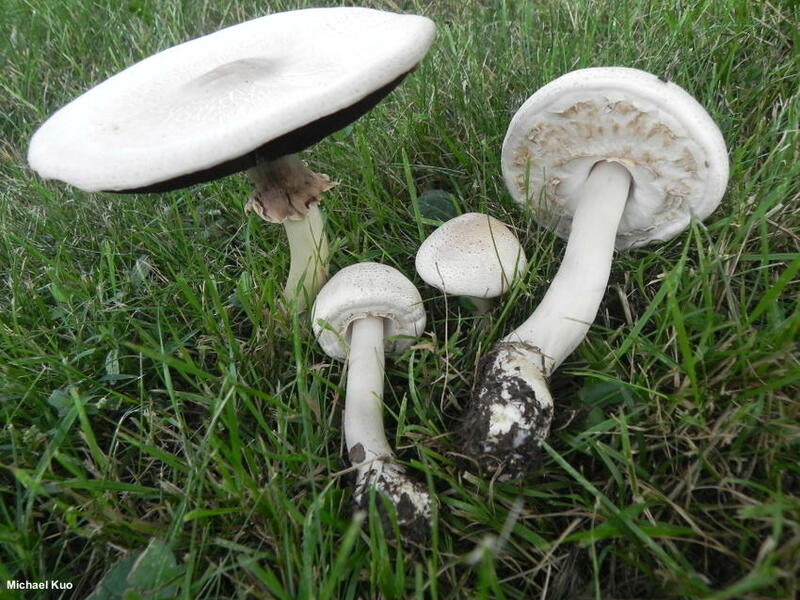 This Agaricus species is widespread and fairly common in North America, usually appearing in grassy areas in urban settings, but also known from thin woods (especially on the West Coast). Its species epithet, xanthodermus, means "yellow-skin"—a feature that can be detected by rubbing the mushroom's surfaces with your thumb, especially near the edge of the cap and the base of the stem: Agaricus xanthodermus turns fairly bright yellow when bruised. 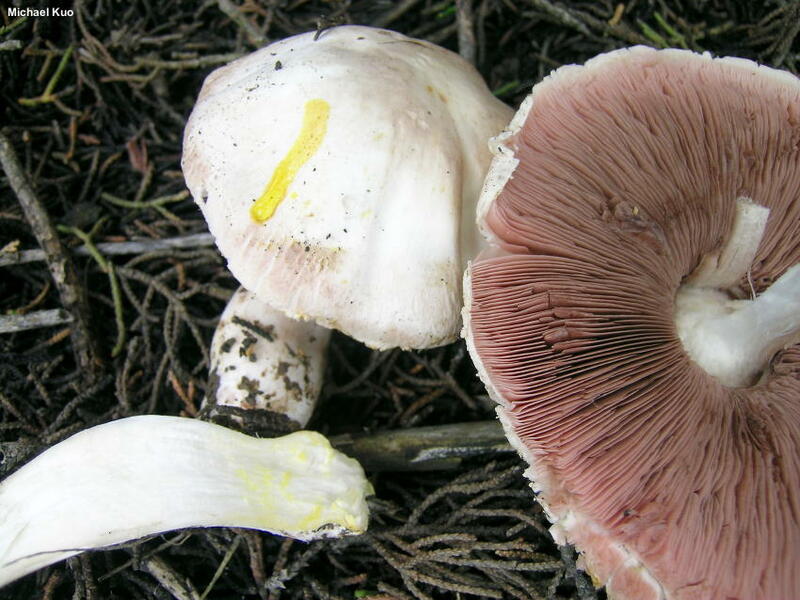 There are dozens of Agaricus species that bruise yellow, however, so other features will need to be matched: the flesh in the base of the stem (when sliced open) is bright yellow; the ring has a thick outer edge; and the whitish to pale brown cap is fairly large but surprisingly thin-fleshed (this is especially evident in dried specimens). Some authors stress the strong phenolic odor, best detected by crushing the base of the stem, but since I am usually "smell blind" to this odor I will leave that detail to others. 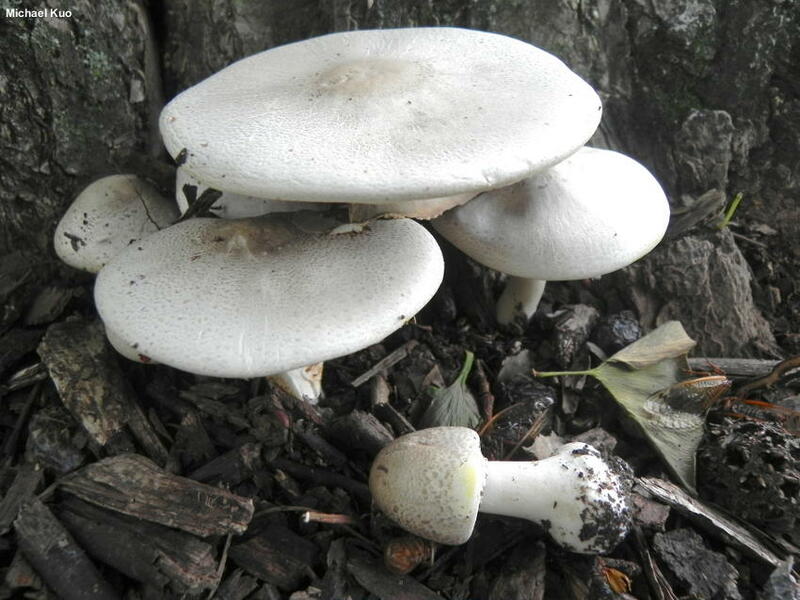 "Agaricus xanthoderma" is an error in Latin agreement found in some sources. Ecology: Saprobic; growing scattered or in large groups, sometimes clustered together or in arcs; usually appearing in grassy, cultivated areas, but occasionally found in thin woods (especially on the West Coast); summer and fall, or over winter in warm climates; probably widely distributed in North America. The illustrated and described collections are from California and Illinois. Cap: 6–15 cm; round to irregularly convex when young, expanding to broadly convex or nearly flat; dry; bald, or with scattered fibrils; thin-fleshed; whitish, or brownish to pale brown, especially towards the center; usually bruising yellow when rubbed, especially near the margin—the bruised areas then changing to brownish after some time has elapsed; the margin inrolled when young. Gills: Free from the stem; crowded; short-gills frequent; whitish at first, then pinkish, and finally dark brown; when in the button stage, covered with a membranous white or yellowed partial veil. Stem: 4–15 cm long; 1–3 cm thick; more or less equal above a slightly enlarged base; bald; whitish, bruising yellow (then brownish); sometimes brownish overall in age; with a large, flaring, thick, yellow-staining ring that has a thick outer edge. 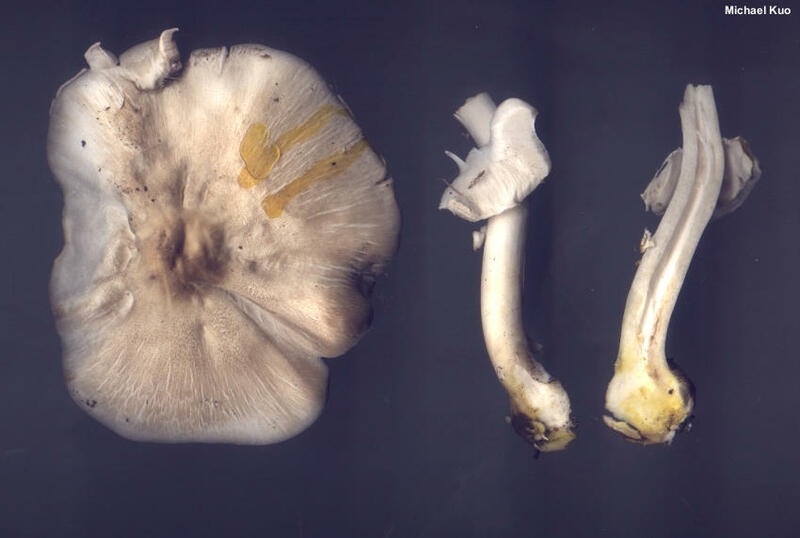 Flesh: White; sometimes yellowing when sliced; bright yellow in the base of the stem. Odor and Taste: Odor reported as phenolic, but sometimes faint; crush the flesh in the stem base to be sure. 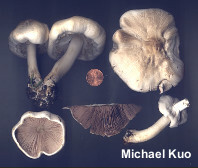 Dried Specimens: Dull brown overall; cap notably thin-fleshed and fragile. Chemical Reactions: KOH yellow on cap surface. 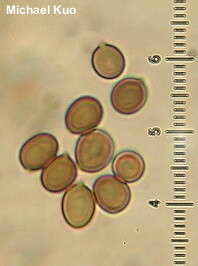 Microscopic Features: Spores 4.5–5 x 3–4 µm; ellipsoid; with a tiny apiculus; smooth; thick-walled; brownish to brown in KOH. Basidia 4-sterigmate. Lamellar edge often eroded and poorly defined; cheilocystidia when discoverable 20–30 x 4–8 µm, clavate to subcylindric or subsphaeropedunculate, smooth, septate, thin-walled, hyaline in KOH. Pleurocystidia not found. Pileipellis a cutis; elements 2.5–7.5 µm wide, smooth, hyaline to yellowish or brownish in KOH. REFERENCES: Genervier, 1876. (Saccardo, 1887; Arora, 1986; Kerrigan, 1986; Phillips, 1991/2005; Lincoff, 1992; Nauta, 2001; Kerrigan et al., 2005; Miller & Miller, 2006; Knudsen, Lange & Knutsson, 2008; Kuo & Methven, 2014; Desjardin, Wood & Stevens, 2015; Evenson, 2015; Kerrigan, 2016; Siegel & Schwarz, 2016.) Herb. Kuo 08230206, 01130514, 01110606, 06201101, 06201102.